Call Us Today for information about our home security systems as well as Electrical Contracting! Our primary goal at A-Plus Electric, Inc. is to serve the residential and commercial electrical needs of Northwest Florida. From changing a defective receptacle and new house wiring, to wiring a transfer switch for your portable generator and installing an automatic home standby system, our objective is to be your most reliable resource for all of your electrical issues and concerns! Feel free to give us a call for more information about our services, or to schedule an appointment for an estimate. We look forward to working with you soon. A Plus Electric has been an industry leader of both residential and commercial electric contracting jobs. We are consistently integrating environmentally friendly practices by offering solar electric installation and "green" electrical wiring. Our expertise ranges from basic generator repair to burglar alarm system installation. Our work is always guaranteed to your satisfaction! For service such at solar panels and burglar alarm systems, dependability is vital. A customer needs to make sure that their systems are operational when they're needed most. What's the point in a solar electronic installation if it doesn't adequately minimize energy bills, or a burglar alarm system that is poorly wired and sometimes shuts off? For A Plus Electric, we guarantee the highest quality installations that will not suffer the same issues that the under functional, inefficient competing companies are known for. We provide affordable generator repair services! With A Plus Electric, Inc. you can rest assured that no matter the magnitude of your project, large or small, we will work hard to complete each job on time, and stand by the work that we do. 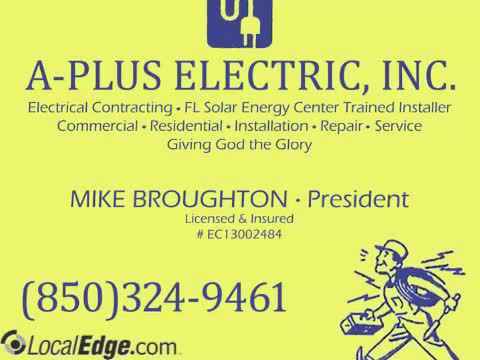 Mike Broughton is the Electrical License holder for A Plus Electric, Inc. He has been a registered electrical contractor in the state of Florida since June of 1993, and in January of 2005 became a State Certified Electrical Contractor. Before entering the electrical construction field Mike spent 10 years in the U.S. Marine Corps as an Aviation Electrician. Vast amounts of Military training gave Mike a well-grounded knowledge of electricity, electronics & solar electric installation. A Plus Electric, Inc. is also able to help our customers with their home security. We will come out to your home/office and provide a free consultation for alarm and burglar systems. We offer competitive pricing and do so with our local customer service. No having to wait long hours on the phone hoping to get a representative. Our advanced systems will allow you to be able to access and monitor your home/business from the convenience of a smart phone or tablet device. We are also proud to offer Honeywell Security Systems here locally on the Gulf Coast. If you are looking for peace of mind knowing your possessions, loved ones or employees are safe and secure, then call on the experts at A Plus Electric and be sure to ask about our promotional systems! A Plus Electric proudly serves Escambia County, Santa Rosa County, and surrounding areas from their Pensacola, FL location. If you are in the need of generator repair, or home security installation, A-Plus Electric is easily the best in the industry. Call today to ask about electrical contracting from the Pensacola, FL area's finest electrical specialist, and find the dependability that so many commercial and residential clients already enjoy. Santa Rosa County, Escambia County, and Surrounding Areas. With A-Plus Electric, Inc. you can rest assured that no matter your project, large or small, we will work hard to complete each job on time, and stand by the work that we do. Give us a call for more information or to schedule and estimate.